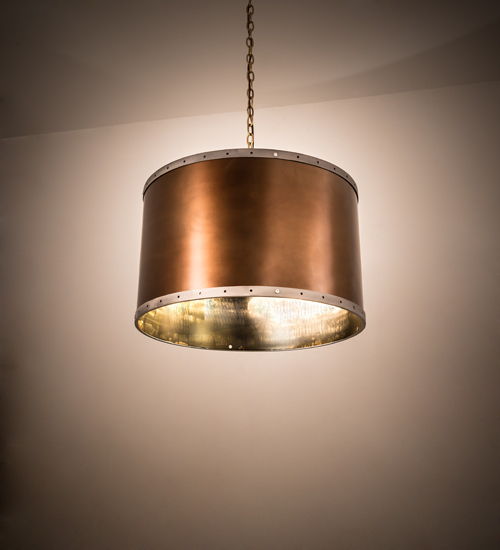 Description: A historic inspired pendant featuring an industrial design, Cilindro Hanover embodies a Copper finished metal shade with a burnished interior and Brushed Steel trim with decorative perforations around the perimeter on both top and bottom. This classic, curvaceous shade is enhanced with a Statuario Idalight bottom diffuser. The handsome pendant is custom crafted in our manufacturing facility in the USA. Custom styles, sizes and colors are available, as well as energy efficient lamping options such as LED. The 26-inch wide fixture is UL and cUL listed for dry and damp locations.